Goldfish are typically highly enthusiastic eaters -- so displeasure with food is one of the first signs that something could be wrong, according to Complete Goldfish Care. Spitting out food can be caused by something as simple as unhappiness with what is being served for dinner or by a potentially dangerous disease. Goldfish are typically hearty eaters and don't usually refuse any food. However, according to The Goldfish Sanctuary, some goldfish can possess pickier palates than others and may decide they don't like the particular type or brand of food that is being offered. If you have a healthy goldfish that spits out his food after seemingly tasting it you might want to try another type of food. Goldfish will eventually eat once they get hungry enough. Changes in eating habits generally accompany a bout with stress. According to AquariumFish, if your goldfish is taking food into his mouth and then immediately spitting it out, he's possibly under stress related to unfavorable water conditions. If stress is the reason he is purging his food, you can help your goldfish by temporarily removing him fish from his bowl or tank and cleaning it thoroughly. Clean any gravel in the habitat and change some or all of the water, add some aquarium salt and elevate the water's temperature. Goldfish tend to nibble at the things in their bowl or tank, including gravel. Sucking the algae off rocks at the base of their habitat is a common goldfish behavior and one that can accidentally result in a blocked windpipe. If one of your fish has a rock stuck in his mouth, it could make eating problematic and may be the reason he is spitting out his food. You should consult with a veterinarian regarding how to treat a goldfish with a blockage. Certain parasites, including flukes, attack the gills of goldfish, causing them to become pale and inflamed, and hampering the regular breathing process. If a fish is having problems flapping his gills naturally while eating, he may spit out his food due to the limitation. Medications specifically designed to help cure parasitic infestation in goldfish are sold in most pet stores. 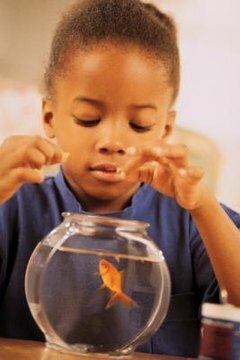 According to Complete Goldfish Care, the faster you begin treating a disease, the better the chances your goldfish will survive.